The Dashing Buccaneer Mouse is a breed of mouse found in the Harbour. With a slash and a dash, these mice hit hard and fast! Not one to let a pegged leg slow them down, they are the forefront of every pirate attack and are the first aboard enemy ships! The Dashing Buccaneer Mouse has no specific preference for any kind of cheese. Hunters must have an active Pirate Bounty to attract this mouse. Hunters must capture a Pirate Mouse to obtain a pirate bounty. When Hunters begin the search for the mice listed on the crew manifest provided by the Pirate Mouse, the 5 Pirate Crew mice are added to the mouse population of the Harbour. Capturing all 3 mice listed on the crew manifest will reward the player with booty from the pirate bounty. The Dashing Buccaneer Mouse drops the Pirate Crew Egg during the annual Spring Egg Hunt. 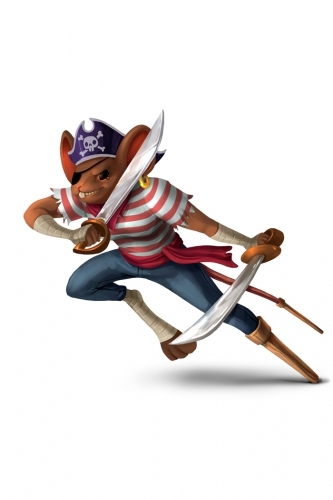 11 April 2017: The Dashing Buccaneer Mouse was added to the game with the introduction of new content to the Harbour location. 17 October 2018: The Dashing Buccaneer Mouse changed mouse groups from Aquatic Order to Dock Dwellers. This page was last edited on 6 December 2018, at 19:38.